Fortunately there are several options you have to help your furry loved one. Some of these products may work better for your pet than others. Try several to find what works best. A combination may work well too. If separation anxiety in dogs or cat anxiety is an ongoing problem for your pet and these measures don’t help, you may have to consider some prescription anti-anxiety drugs. Consult your veterinarian about the dog or cat behavior you are seeing if you plan to take this route. Pheromones are often used for all kinds of dog and cat behavior in stressful situations. Pheromones are chemicals animals use to communicate with each other. Feliway® is for cats and is the marking scent cats have on their face. When they rub their chins along something, they are leaving their mark behind saying it is theirs and it is safe. When they smell Feliway®, it has the same effect. They think it’s theirs and they tend to calm down. We always recommend this product. Its fantastic to help reduce any cat stress! Be sure to use enough of it (it comes in sprays or diffusers that plug into a wall outlet) so your cat encounters it throughout the house. When traveling, spray the carrier and put a bandana pre-sprayed with Feliway® on your cat. Adaptil™ is for dogs and is the scent from mother dogs. Dogs of all ages can respond though the amount of calming will vary depending on the individual dog. The heavier the concentration is the better. This can even help with separation anxiety in dogs. Spray a bandana (at least 5 pumps) and put it on your dog. You can also rub it on his chest. The room plug-in may help but doesn’t work as well on its own. Pheromones don’t work instantly to relieve dog or cat stress and anxiety symptoms. They usually take 5-10 minutes to start working and could take as long as 20-30 minutes. 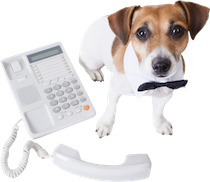 Give your pet enough time if you are using it for a specific stressful event (such as visiting the vet or someone coming to the house). The list of uses is endless. Many dog and cat behavior problems are related to underlying anxiety so you can try a body wrap for any situation. It can also help some puppies and dogs during training. 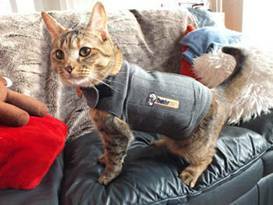 Thundershirt is one commercial brand but there are others. 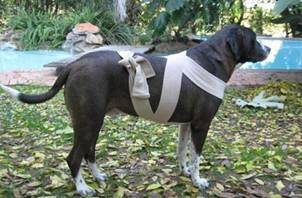 You can also find directions for wrapping your pet with an Ace bandage. It needs to be snug but not tight. If you wrap a bandage around the back legs, just be sure there’s not too much pressure on the inside. Sores can develop from bandages wrapped too tight, and it's also possible to cut off the blood flow to the limbs. There are many herbs and other products that have calming effects on dog or cat stress levels. Some of them even have sedative effects! Lavender scent is calming. The oil is toxic if eaten, however. Put the oil on a cotton ball and rub it onto a carrier for traveling or on furniture in the house. It doesn’t need to smell strong to be effective. Valerian is an herb that can calm your pet and make him sleepy. Give 100 mg of the dried herb for every 10 lbs. of body weight. (The concentrated extract has a different dose.) Repeat in 8-12 hours if needed. The herb smells of dirty socks, so if it stinks, it’s probably good quality! Bach Flower Remedies are extracts from flowers. There are 38 different ones with different effects, and many help with fear or anxiety. They are easy to use and very safe. 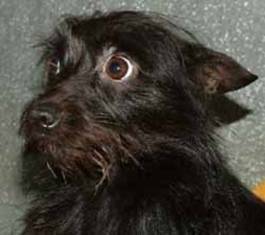 Melatonin will help some dogs who are afraid of thunderstorms or have other noise phobias. Give 1 mg for every 20 lbs. of body weight three times daily. It will work best if given 30 min. before the storm hits. 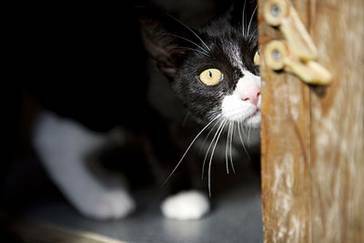 Fear/anxiety is often the underlying reason for many dog or cat behavior problems. You may need to have your pet examined to be sure there's no physical cause for the dog or cat stress. Other products, besides those listed here, may be equally effective. Try to find something that works!